MiCoachee uses four innovative behavior modification methods, all proven to be highly effective in changing habits, thought patterns, and behaviors. Cognitive behavioral therapy (CBT) is concerned with the links between your thoughts, emotions, and behaviors and how that impacts your physical health. It is a sound approach based on neurological and behavioral research proven to promote greater health and improve quality of life. Interested in learning more about CBT? Read this report from the NIH. Neurolinguistic programming (NLP) is an emerging technology within healthcare and centers around a communication framework (visual, auditory, kinesthetic, olfactory or gustatory) using techniques to understand and facilitate change in thinking and behavior. 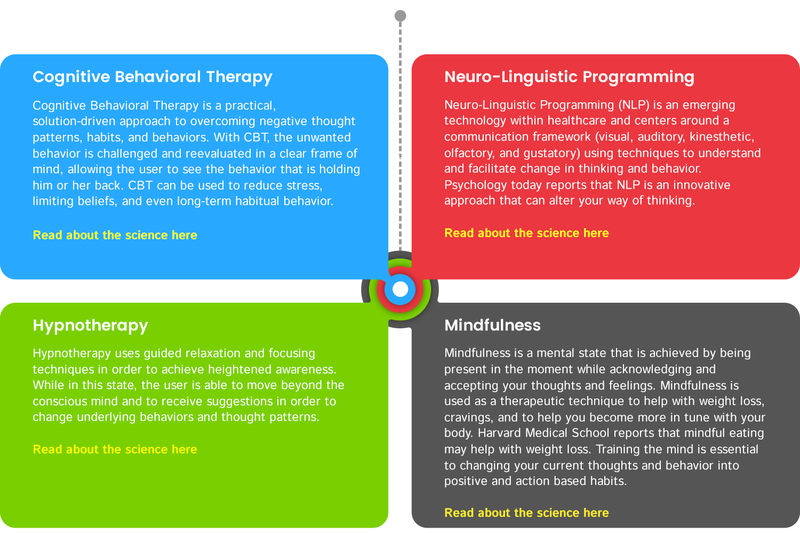 Psychology Today reports that NLP is an innovative approach that can alter your way of thinking. "Hypnosis works and the empirical support is unequivocal in that regard. It really does help people," says Michael Yapko, PhD, a psychologist and fellow of the American Society of Clinical Hypnosis. A study reported by the NIH found significant long-lasting effects from using hypnosis in a behavioral weight-management program. Read more here. Mindfulness is a mental state that is achieved by being present in the moment while acknowledging and accepting your thoughts and feelings. Mindfulness is used as a therapeutic technique to help with weight loss, cravings, and to help you become more in tune with your body. Harvard Medical School reports that mindful eating may help with weight loss. Training the mind is essential to changing your current thoughts and behavior into positive and action based habits. We apply all four of these innovative techniques to our coaching system to provide you with in-depth, personalized coaching tools that are specifically chosen based on your goals, needs, and difficulties. With our Advanced Learning Technology, we make it easy for you to provide us with feedback about where you are in your health journey, your short and long-term goals, and what’s stopping you from achieving those goals. Once we get your data, we can select the most effective tools that help you rise above your challenges and keep you motivated to stay on track. Even better? This isn’t a one-time thing! Send us your feedback and integrate your favorite fitness trackers like FitBit or Apple Watch or fitness apps like MyFitnessPal and Google Fit and we’ll use your information to get a total picture of where you are and your progress and provide you with a comprehensive assessment. Sounds easy and convenient, right? It is! And don’t worry, all information is 100 percent confidential and judgement-free. We’re here to help you discover the strength and determination you need to make health a lifestyle choice. MiCoachee gives you innovative, effective behavior science techniques combined with personalized coaching that has you leaving behind your roadblocks and going the distance toward your health and fitness goals.